The growing population of stranded UACs follows the implementation of a new security policy by officials working for President Donald Trump. The policy requires officials to check the identity of people in the United States who wish to “sponsor” the migrant children so they can live in the sponsors’ homes. Since the checks began this year, officials have been able to arrest more than 30 would-be sponsors — or sponsors’ housemates — who are illegal immigrants. The threat of detection and arrest is deterring illegals from sponsoring UACs. This threat ensures that the UAC population in government shelters has ballooned up to roughly 13,000 UACs. Before the checks began, many Central American illegal-immigrant parents, relatives, and labor brokers paid coyotes to deliver roughly 180,000 children to U.S. border officials. The process began once a 2008 law barred border officials from repatriating some trafficked youths. 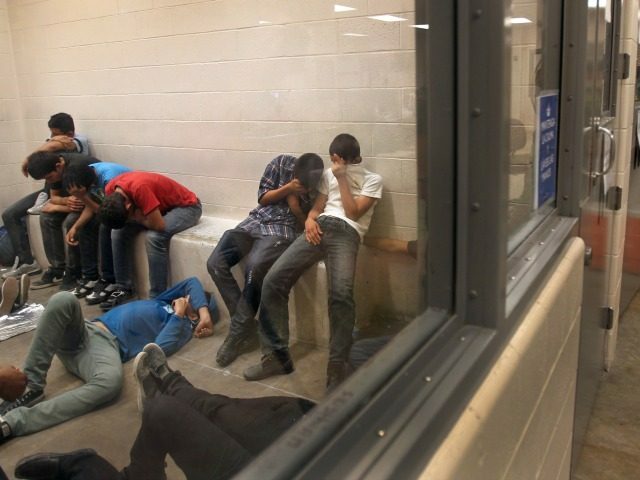 President Barack Obama’s deputies interpreted the law as directing them to place Central American youths into the care of the Department of Health and Human Services. In turn, Obama’s HHS allowed illegal immigrants to sponsor the smuggled youths and children until judges decide if they can stay in the United States. Trump’s security checks and arrests have broken this coyote-to-HHS-to-parent delivery process which was quietly created by Obama’s officials. The average length of time that migrant children spend in [HHS] custody has nearly doubled over the same period, from 34 days to 59, according to the Department of Health and Human Services, which oversees their care. The smuggling route may expand again if U.S. pro-migration groups can block Trump’s security checks, perhaps by replicating the June uproar over Trump’s “zero tolerance” policy of prosecuting all migrants crossing the border. Trump ended that prosecution policy when the media showcased many of the distressed children who were sheltered separately from their detained parents. Since then June, Attorney General Jeff Sessions has implemented alternative reforms to block the migrant inflow. In 2014, 58 percent of sponsors were the parents or legal guardians of UACs, according to HHS data provided to Breitbart News. That number dropped to 46 percent in fiscal-year 2017, the data shows. However, a larger share of the UACs is being picked up by relatives living in the United States. In 2014, 28 percent of the UACs were picked up by siblings, aunts, uncles or grandparents, according to HHS. In 2017, that percentage jumped to 38 percent. Many of those sponsoring relatives may be living legally in the United States. The agency has handed off more than 180,000 children and youths since late 2013 to sponsors. Very few of the migrant youths win court approval to stay in the United States, but the courts are so backlogged that few migrants have completed their court cases.